LANA Turvey-Collins does not shrink from the challenge of leading a high-stakes national conversation about the future of the Catholic Church in Australia. As the facilitator of the Church’s historic Plenary Council 2020, she is leading a three-year “transformative journey” with the cultural reform of the Church on the table. “I am not naïve to the significant changes that many want,” Mrs Turvey-Collins (pictured) said, referring to a Church faced with dwindling numbers, a shortage of priests, and rocked by the revelations of the Royal Commission into child sexual abuse. “If I didn’t have hope then I wouldn’t be in it. If I didn’t have hope about the kind of Church Jesus talks about as Kingdom, why would I be in the role? A Queenslander, with strong academic credentials and with her own life-changing experiences in Africa, Mrs Turvey-Collins acknowledges the robust public debate the plenary will generate, and its ground-breaking potential. “Women’s role in leadership in the Church is something personally relevant,” she said. “I am a 39-year-old woman and if my husband and I have kids, I want our daughters to have a place in Church. “There is already so much great leadership going on and women every day in all sorts of places – lay women, religious women, Catholic teachers, nurses, doctors, scientists and theologians. The last plenary council, held in 1937, was an exclusively male gathering, with only bishops, theologians and superiors of male religious orders attending. The 2020 version has a different complexion with all-of-church participation from a richly diverse community, and the intent to discuss and legislate on a wide range of issues, including matters of faith, morals and discipline. “This is no time for the Church to be putting up signs that say ‘business as usual’,” Brisbane Archbishop Mark Coleridge said, as he announced the plenary council more than 18 months ago. He is chair of the Bishops’ Commission for the Plenary Council. “If we needed any proof, then the Royal Commission has shown that,” Archbishop Coleridge said. “I think we have to ask questions about how we become a more missionary Church, and not a Church that is just retiring behind defensive walls. “I think we have to ask questions about ordained ministry. The starting point for Plenary 2020 will be an official launch on Pentecost Sunday (May 20), with an invitation to Catholics and Catholic organisations to provide their views, through a range of meetings and online kits – downloadable from a plenary council website that goes live in May. “And anybody can answer that: whether you’ve got a theology degree or not, whether you’re a five-year-old or a seventy-year-old, you can engage in that question,” she said. Mrs Turvey-Collins grew up in Beenleigh, south of Brisbane, attended St Joseph’s primary school and Trinity College. She remembers growing up experiencing the Church as a community, with a sense of belonging grounding her faith. “My mum was the head of the presbytery in the parish and we always had priests and sisters and brothers around in our lives,” she said. As a student, she spent a year in Japan, studied commerce and arts at the University of Queensland and at 22 years old moved to Sydney to work for a company running a global exchange program for traineeships. 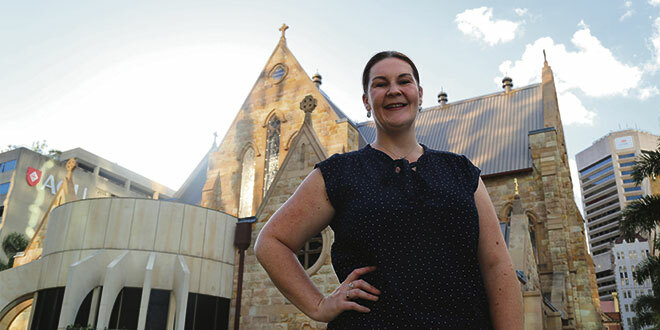 By her late twenties, after extensive work in sales and training, she set a trail-blazing course as director of Catholic Mission in the Sydney archdiocese. “I was the first layperson in the role, and I was under 30, and I was female – so it was a little bit of culture shock,” she said. With no background working for a Church organisation, Mrs Turvey-Collins set about “learning the business” by talking to Church leaders. “I began a journey of not only learning about the Church in Australia but learning about mission. Catholic Mission was encouraging, nurturing and let me explore,” she said. In 2012, Mrs Turvey-Collins took a year-long sabbatical in Zambia, working for the country’s Catholic bishops as a project officer and international liaison. It turned out to be a time of deep spiritual growth. “It was the first place I had ever experienced being in the minority,” she said. “I also experienced the vulnerability and open-heartedness of being human, that poverty creates inter-dependence and a real need of having other people in your life. “And that space – the Catholic parish – was no longer a place you go to for one hour on a Sunday, it was a deep, integrated part of how people considered their lives. Mrs Turvey-Collins said her Zambian experience helped her to see that the “way of being Church” was “loving one another so deeply that you help each other to survive”. “This is the Church Jesus talked about as Kingdom,” she said. Back with Catholic Mission in Australia, Mrs Turvey-Colins became part of a team offering formation training for staff within Catholic sector organisations. Her skills helped many Catholics find their “mission” in their work and life, and led her to apply for the role of facilitator for Plenary Council 2020. Her Catholic Mission colleagues Peter Gates and Columban Father Noel Connolly also became part of a facilitation team that held its first meeting with the bishops’ commission and an executive committee for Plenary Council 2020, late last year. She sees her work on the plenary as an extension of her Catholic Mission work. “My job as facilitator is to create spaces where all of those people with all of those different perspectives can engage with one another, and that we genuinely listen to God by listening to one another, and that we discover what the Spirit is trying to say to us,” she said. After the first plenary stage of listening and dialogue, contributions will be collated by the plenary council organisers and used to develop some discussion documents for the plenary council. The plenary council will then be held in two sessions, the first in October 2020 in central Australia (in Adelaide, Alice Springs or Darwin), and a second in May 2021, most likely in Sydney.